Moving in sync with others affects social behaviour from a very young age, as seen in this photo of a youngster handing markers back to McMaster researchers after they 'accidentally' dropped them during their research. Whether they march in unison, row in the same boat or dance to the same song, people who move in time with one another are more likely to bond and work together afterward. 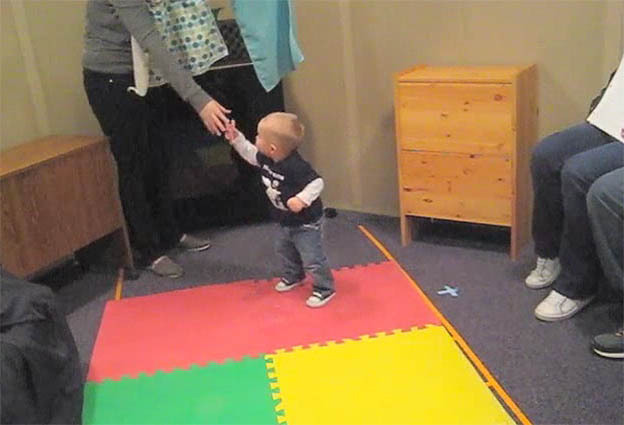 It’s a principle established by previous studies, but now researchers at McMaster have shown that moving in time with others even affects the social behaviour of babies who have barely learned to walk. Cirelli and her colleagues in the Department of Psychology, Neuroscience & Behaviour showed that 14-month-old babies were much more likely to help another person after the experience of bouncing up and down in time to music with that person. Cirelli and fellow doctoral student Kate Einarson worked under the supervision of Professor Laurel Trainor, a specialist in child development research. They tested 68 babies in all, to see if bouncing to music with another person makes a baby more likely to assist that person by handing back “accidentally” dropped objects. Working in pairs, one researcher held a baby in a forward-facing carrier and stood facing the second researcher. When the music started to play, both researchers would gently bounce up and down, one bouncing the baby with them. Some babies were bounced in sync with the researcher across from them, and others were bounced at a different tempo. When the song was over, the researcher who had been facing the baby then performed several simple tasks, including drawing a picture with a marker. While drawing the picture, she would pretend to drop the marker to see whether the infant would pick it up and hand it back to her – a classic test of altruism in babies. The babies who had been bounced in time with the researcher were much more likely to toddle over, pick up the object and pass it back to the researcher, compared to infants who had been bounced at a different tempo than the experimenter. While babies who had been bounced out of sync with the researcher only picked up and handed back 30 per cent of the dropped objects, in-sync babies came to the researcher’s aid 50 per cent of the time. The in-sync babies also responded more quickly. The findings suggest that when we sing, clap, bounce or dance in time to music with our babies, these shared experiences of synchronous movement help form social bonds between us and our babies. It’s a significant finding, Cirelli believes, because it shows that moving together to music with others encourages the development of altruistic helping behaviour among those in a social group. It suggests that music is an important part of day care and kindergarten curriculums because it helps to build a co-operative social climate. Cirelli is now researching whether the experience of synchronous movement with one person leads babies to extend their increased helpfulness to other people or whether infants reserve their altruistic behaviour for their dancing partners. <span style="font-size: 13px;">Whether they march in unison, row in the same boat or dance to the same song, people who move in time with one another are more likely to bond and work together afterward.</span> It’s a principle established by previous studies, but now researchers at McMaster have shown that moving in time with others even affects the social behaviour of babies who have barely learned to walk. “Moving in sync with others is an important part of musical activities,” says Laura Cirelli, lead author of a paper now posted online and scheduled to appear in an upcoming issue of the journal Developmental Science. “These effects show that movement is a fundamental part of music that affects social behavior from a very young age.” Cirelli and her colleagues in the Department of Psychology, Neuroscience &amp; Behaviour showed that 14-month-old babies were much more likely to help another person after the experience of bouncing up and down in time to music with that person. Cirelli and fellow doctoral student Kate Einarson worked under the supervision of Professor Laurel Trainor, a specialist in child development research. They tested 68 babies in all, to see if bouncing to music with another person makes a baby more likely to assist that person by handing back “accidentally” dropped objects. Working in pairs, one researcher held a baby in a forward-facing carrier and stood facing the second researcher. When the music started to play, both researchers would gently bounce up and down, one bouncing the baby with them. Some babies were bounced in sync with the researcher across from them, and others were bounced at a different tempo. When the song was over, the researcher who had been facing the baby then performed several simple tasks, including drawing a picture with a marker. While drawing the picture, she would pretend to drop the marker to see whether the infant would pick it up and hand it back to her – a classic test of altruism in babies. The babies who had been bounced in time with the researcher were much more likely to toddle over, pick up the object and pass it back to the researcher, compared to infants who had been bounced at a different tempo than the experimenter. While babies who had been bounced out of sync with the researcher only picked up and handed back 30 per cent of the dropped objects, in-sync babies came to the researcher’s aid 50 per cent of the time. The in-sync babies also responded more quickly. The findings suggest that when we sing, clap, bounce or dance in time to music with our babies, these shared experiences of synchronous movement help form social bonds between us and our babies. It’s a significant finding, Cirelli believes, because it shows that moving together to music with others encourages the development of altruistic helping behaviour among those in a social group. It suggests that music is an important part of day care and kindergarten curriculums because it helps to build a co-operative social climate. Cirelli is now researching whether the experience of synchronous movement with one person leads babies to extend their increased helpfulness to other people or whether infants reserve their altruistic behaviour for their dancing partners.